Sales Leaders: Do You Know Your #1 Priority? But how do you know which is your REAL #1 priority? The Boss has an agenda; she doesn’t stop to think about the best use of your time. The CFO has a different agenda; it’s all about the spreadsheets and numbers. The Spouse knows that his/her own work commitment is too important to miss. And you, well, you just want everyone to stop pulling you in a hundred different directions. Constant ‘fire fighting’ (working reactively instead of proactively) weakens productivity and inhibits the time set aside for high level strategizing. Improper sales training leads to an unprepared sales team who lacks confidence and consistently underperforms — and constantly demands your attention. If you are feeling overworked, stretched beyond your limits and like you just want your life back, then it’s time to identify your top priorities as a sales leader so that you can strategically, intentionally and confidently control your own weekly calendar and daily schedule. 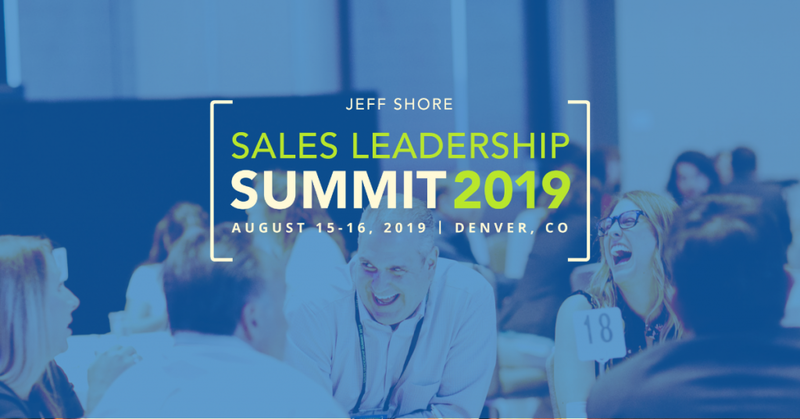 Now I have an application for you: Come to our annual Sales Leadership Summit in Denver this coming August. Join hundreds of sales leaders who are all focused on the same thing: to solidify their priorities and figure out how to execute at an entirely new level of excellence. Learn, network, ask, share, and get the career refreshment that you know you need. Come to the Jeff Shore Sales Leadership Summit and experience what thousands of managers have been a part of. Come with the expectation that your world will be changed.